It’s my fault, really. I never noticed the page length section on the Amazon.com site. I especially didn’t notice that ebooks state a page length equivalent in that section. In fact, I’m so blind, I had to LOOK for it after someone told me it was there. Somehow my eyes have always skipped over it. Amazon places it there, clear as day. I just never saw it. I will never miss it again. I will always look now. 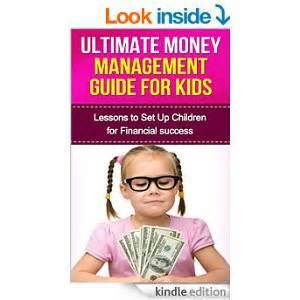 Ultimate Money Management Guide for Kids is little more than a pamphlet, and is far from “ultimate” or a “guide.” After all, it is only SEVENTEEN pages long. It takes about ten to twenty minutes to read (depending on your reading rate – took me roughly 8 minutes total, a good 2 minutes of that was spent trying to figure out where the rest of the book was), and though there are five chapters, they are each short enough to be included in a brochure. The kind you see at seminars or conventions. Instead of being an ultimate guide, I’d consider it a solid introduction to themes you would like to teach. There are few steps or how-to lists, mostly just conjecture and opinion. Good opinions, mind you, but I wouldn’t feel comfortable promoting this as a personal finance or parenting guide of any kind. Instead it’s a nice conversation starter. Free ebooks of this title were being passed around several homeschool sites a few weeks back. 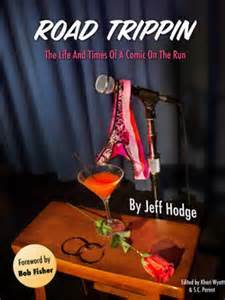 I consider this an appropriate way to acquire this book. But the kindle format sells on Amazon for $2.99 and I can’t help but wonder how many people have been disappointed by the lack of substance and length for their money. Not many because the reviews on Amazon are mostly positive. This surprises me. In addition to it’s lack of length, there were a few editing hiccups that I urge the author to review. As a writer, I understand all too well the frequency of errant typos (my own first edition has many of them), but in a document that could be considered little more than a lengthy blog post, I’m surprised the errors slipped through. I’m sure typos appear in my blog as well. There might be some in this very post because I rarely go through an edit – I’m not an editor. But I’m also not charging you to read this, so I feel in that regard I have a right to be a little lazy about punctuation placement and grammar choices. When I start charging $2.99 for you to read my blog, I promise to edit better. Then again, I’d never do that. Early in the introduction of the title, the author writes, “Empowering children with good financial education will ensure that they are better prepared for life and all matter finance. It is the responsibility of parents to teach their children about money.” Indeed. But he spent little time explaining how one should do so. Gregory O. has some great ideas and on many points I agree with him. The book as a whole would make a marvelous opening speech for a seminar on teaching parents to teach their children about money matters, but it doesn’t stand well alone. I wish O. would have developed the topic more before releasing it as a “book” for sale at $2.99. (I know, I keep repeating this information, but it just hasn’t stopped baffling me. $2.99 for 17 pages! What?) Lower the price to 99 cents or keep it free and I have little to fuss about, because it serves as a positive starting point for parents to encourage economic intelligence in their children. It simply falls short of what else is being produced in the industry on the same topic. I’ll take my 8 minutes back, please. But that’s IF you can stay connected to the wifi. Clearly, I’m on my wifi now – typing this onto my online blog. My kindle, however, can’t find the connection. Can’t make the connection. When I do have a connection I download everything I can as fast as I can because there’s no telling when it will disappear. I CAN guarantee that it will disappear if I plug my device into my computer to manage documents or to charge it. As soon as I unplug, I have to set it all back up again. When I have a connection, it loves to download things I didn’t ask for. Those pages at the end of books that invite you to read other stuff the author has written? Yeah, avoid them like the plague unless you have plenty of money and really love the author. You even blink at that page and it will download the book. I called customer service and the very helpful people un-downloaded it for me and returned my money… for the book I had already read instead of the one I didn’t want. I had to call back and say, “Nope, you got the wrong one. I need that book, I should be charged for that book as I already read it… it’s the OTHER one I don’t want.” Currently I don’t have either. Despite their speediness in answering phones (no lengthy wait times for these awesome people), I am not looking forward to calling yet again. You would think this is user error. I thought so too. Clearly, it’s me we’re talking about here. Technology is not my strong point. However, I can read directions. I can navigate myself around websites, and I READ. (Also, there are tons of online complaints about the same issues I’m having.) More and more I’m finding that technology is not my strong suit because there always seems to be something wrong with it. Computers always get viruses. Phones drop calls. The electronic features in your car leave you trapped inside after a car accident because the door won’t open and the paramedics have to pull you through a window (true story); the electronics features in your (different) car stop working and the window just FALLS down while you’re driving down the highway. Kindles forget how to find their wifi. It’s not so much that I’m ANTI-tech… it’s that it is only worth it to me when the tech is actually making my life easier, not more difficult. Yay! 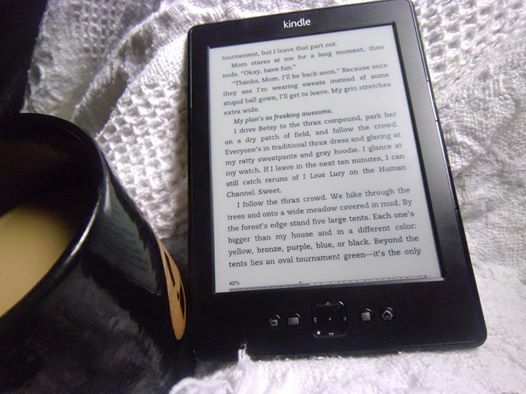 I read 7 books on my kindle. They were great books! I enjoyed my time with them. But were it not for my extensive physical library, I’d be out of reading material before bed tonight. Historical fiction that involves research and spans time within a story is always my favorite. Diane Setterfield’s The Thirteenth Tale, any of Kate Morton’s novels, A.S. Byatt’s Possession… these are among my must own forever books. 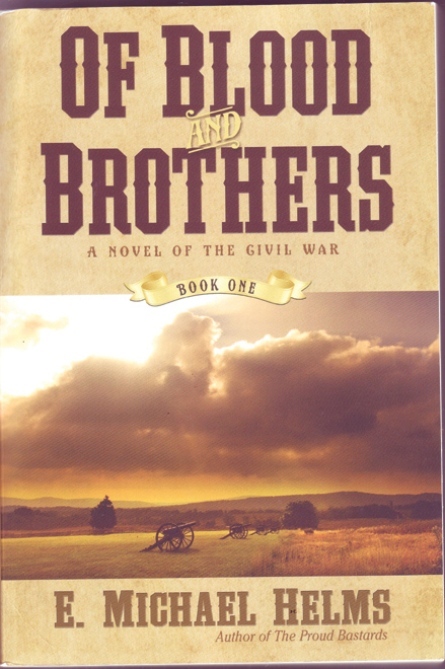 So, of course, I was pleased to discover E. Michael Helms’ Of Blood and Brothers series, which follows reporter Calvin Hogue (from 1927) as he researches the story of the Malburn Brothers (who fought in the Civil War). As a child from the South, I adored Civil War tales. I didn’t care whether they were written from our perspective or the Yanks, I just couldn’t get enough of it. Gentle Annie and Red Badge of Courage were both beloved titles during my elementary school years. I played Colonel Shaw in the school play of Glory. Part of my obsession with Little Women was the mid-to-post war setting. E. Michael Helms took me back in time to Elijah Malburn, and I got to experience being stolen from by the Confederates, being interrogated by the Union soldiers, and working at the saltworks. I traveled with Jefferson, the Malburn’s slave and found it oddly appropriate that the rift that doomed the brothers wasn’t just a political one, but one that included a girl. I could easily turn this review into a political debate – there’s plenty to talk about, especially with me being from the south and having all sorts of views on the Confederacy. But that wouldn’t do Helms’ work justice. It’s a darn good book and I’m looking forward to the sequel. I know I just posted on this very same title yesterday, but I’ve been reading through it over my morning coffee on this cold, rainy day, and I couldn’t keep myself from sharing the best parts. This melted me to my core. Melted me into a state of beautiful stillness, and I couldn’t keep that to myself. It’s so calming, so true, and so utterly gorgeous. Not just for his poetry itself, Housman is inspiring because his work is so good and back in 1896 he was essentially self-published. Publishers turned this beautiful work down over and over again until finally he decided to publish the title at his own expense. Originally he wanted to call it The Poems of Terrence Hearsay, but was encouraged to change it. Sales lagged until about 1899 when the Second Boer War broke out and profits have surged for Housman’s work during every time of war since – especially World War I. Though this surprised the poet, it is not surprising to me… the entire work is about loss. 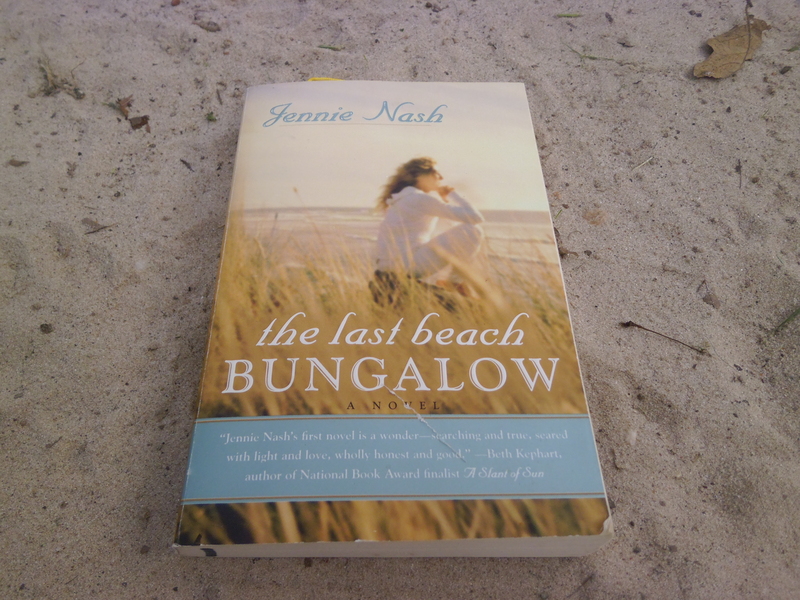 There is much solace in reading about loss when you have lost or anticipate it soon. Don’t be surprised if Housman is revisited often on this blog. A few years ago I became completely hooked on the Penguin Great Ideas series. I think they’re wonderful pocket sized source documents to keep around the house. I also love the Great Journeys… and now, I have a small collection of English Journeys as well. The kiddo and I love scampering through the woods. 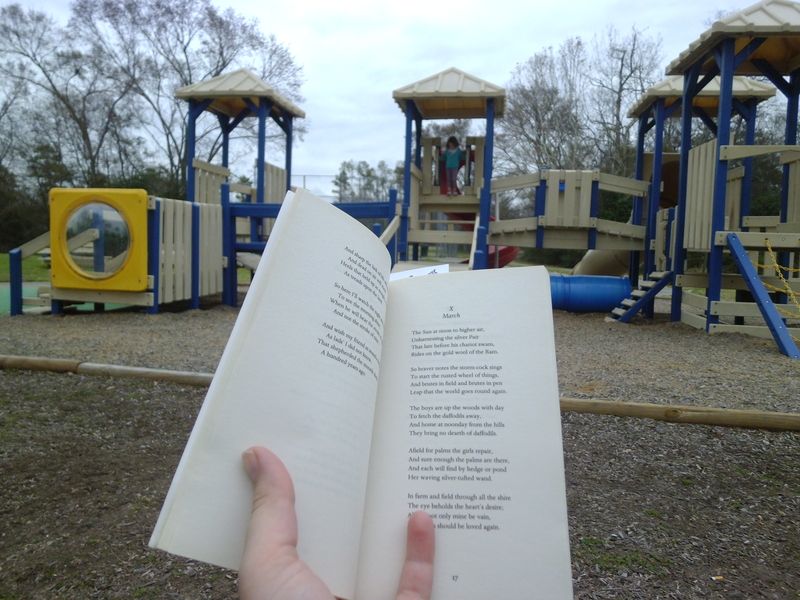 We also love reading outside. 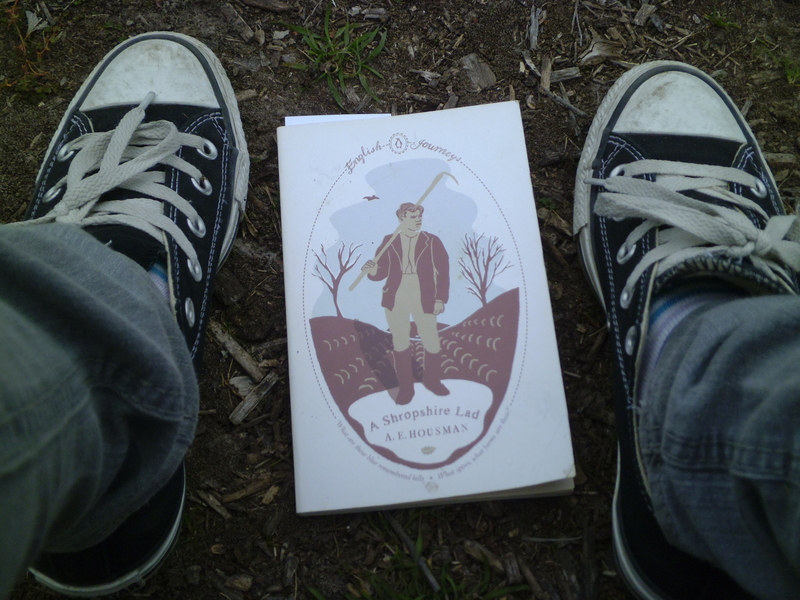 These little paperbacks are the perfect books to tag along for our wooded adventures and frolics in the park. Not to mention that, today, I think Housman became my favorite male poet – a title previously held by William Carlos Williams. The two are nothing alike. But I am nothing like who I was when William Carlos Williams was awarded his place on my mental pedestal. I don’t want poetry to be sarcastic anymore. I don’t appreciate the uncaring witticism the same way. Ok, well, it seems it’s always the jerk lines that appeal to me. But at least it’s not about stealing plums anymore. Housman has real heart and soul as he describes landscapes and lovers, crickets and dead soldiers, the woods and the very real feelings of longing for something that has gone. All so beautiful and natural; and the pattern in which he writes lends itself to easily reading it aloud outdoors while the kiddo plays. The dog seemed to enjoy it too. He stopped to look at me every time a poem ended as though I was denying him the chance to be included in the written word of humans. I have to say, I think Jane Austen is one of the greatest writers ever, but not because she was the first to make me care about old-fashioned love stories. I always liked those. In fact, the first time I read Pride & Prejudice I was too young to catch all the subtle things that make Austen great, I think. I read the book because I thought Emma was funny. It’s easier to recognize the humor in Emma, P&P takes a few more reading years under your belt. At least it did for me. What is so awesome about Jane Austen is that shallow readers may enjoy the romantic notions of it all (hence loving the books in elementary school when I was devouring them along side Anne of Green Gables) and still have more to offer as you age. The greatest of writers can be enjoyed by the young and reveal themselves over time with multiple readings. I think I was twelve or thirteen before I realized that most of Austen’s work is pure satire and subtle hilarity. Even though I adore the Bronte sisters, the mastery of language and social fantasy Pollock talks about is what makes Austen’s work accessible to a much wider audience. Wuthering Heights is all dark secrets and emotion, whereas Pride & Prejudice is social commentary, comedy, romance, and more. Look at Darcy, the most introverted socially awkward geek of all time. The only reason he is considered desirable by such a wide array of women is because he has money and a pretty face. Without those two things, he would be Sheldon Cooper of The Big Bang Theory. At least, that’s how I read him. Apparently, I’m not the only one or the movie made in 2005 starring Keira Knightley would have been a bit exasperating. 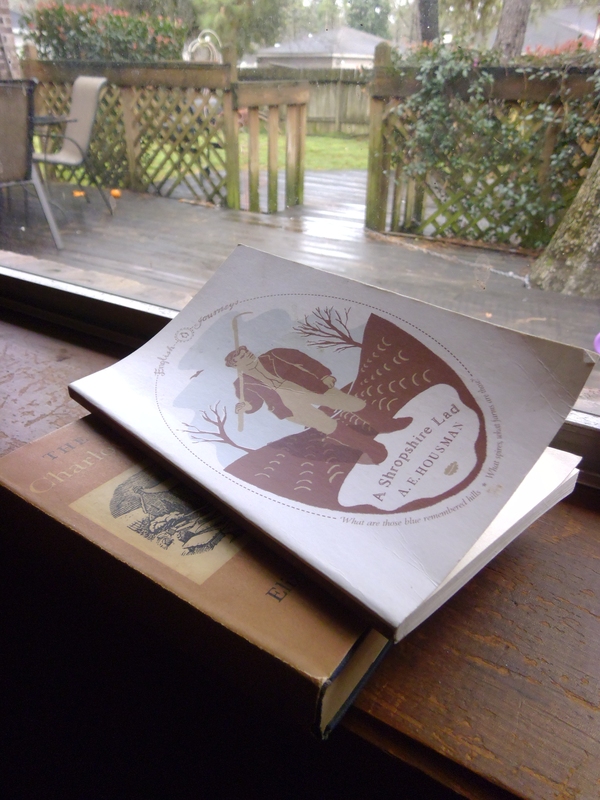 Instead, it has become a favorite on rainy sick days. So Happy 200th Birthday Pride & Prejudice and well done, Jane. Albert Einstein was a prick. Not the description you were expecting? Me neither. We always hear about how brilliant he was, how much he changed humanity and the world of science with his great theories. We always see images of his goofy, yet charmingly wild smile and hair. 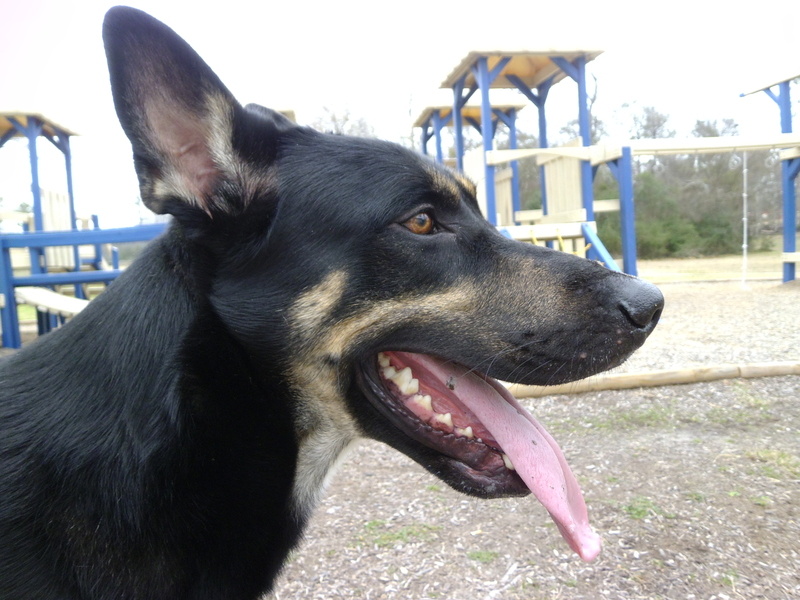 We don’t see him through the eyes of the family he abandoned. 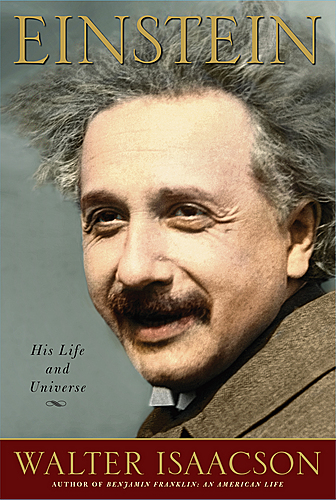 Isaacson is thorough in his research and the language of his biography of Einstein is easy and accessible. He sheds a lot of light on physics formulas that I had a hard time grasping in my high school science classes. But he also sheds a lot of light on Einstein the not-so-family man. Einstein eventually divorced his wife, but not before maintaining an emotional affair with his cousin Elsa. “Companionship without commitment suited him just fine,” Isaacson writes about how Einstein toyed with both women’s heartstrings by alternating his attentions between them. In the end Einstein and Elsa did marry, but not before a questionable letter was written by Elsa’s daughter to a friend that mentioned Einstein’s true love interest was the twenty year old daughter, not the mother. Isaacson’s presentation of Einstein is a great book for high school science and history students. Anyone trying to understand the genius’s formulas should also understand the history surrounding their creation/discovery. His life is also one to discuss with your teen touchy topics of worldview and the importance of values; world changing discovery vs. the importance of family, political and religious affiliations and observations. Each family’s opinion of Einstein’s life will most likely be different, and its one that should be surveyed and critically analyzed. My mother saw me reading Stephen King’s On Writing and scowled at me. “That man is so weird, I don’t know why you would want to read any of his crap.” Says the woman who may or may not have read one of his books. Admittedly, I don’t read much of his stuff. I couldn’t really get into Gunslinger, but I loved Low Men in Yellow Coats from Hearts in Atlantis. 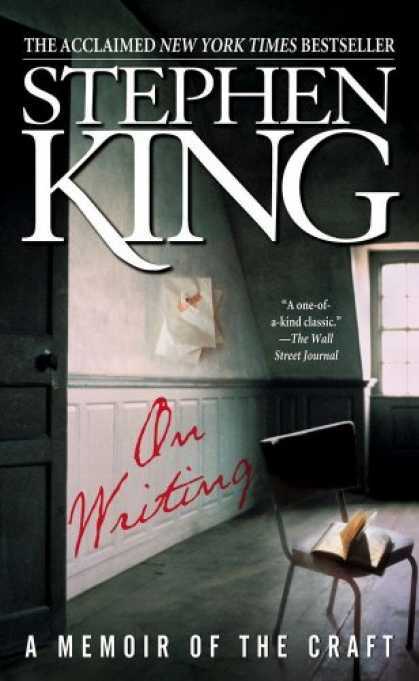 I have no desire to read most things published in the horror genre, but On Writing isn’t horror, its not even fiction, it’s an amazing memoir and guidebook to how The King’s mind really works. On Writing is solid advice from a successful writer to anyone who has ever dreamed of being a storyteller. King is entertaining, down to earth, and extremely informative. He is passionate about his work, and despite many blunt criticisms about typical writing flaws, he offers sound wisdom to budding authors. I found reading On Writing highly motivating. I’ve always been an avid reader, and I’ve always loved to journal and write tidbits of stories that come to me. But reading this really got me in a dedicated routine. I’d start my day off with a little advice from the master of fiction, write the recommended 2000 words for the day, and then pick up some handy little piece of fiction that took my fancy and read until my daughter woke up from her nap. Since reading On Writing, I’ve got myself on a more solid path to finishing a complete draft of my novel than ever. King doesn’t offer any kind of magic fix for suddenly getting published; he just reminds you that you already have the tools to do the job. He gives you the confidence to press on and keep writing because you love it, not because someone told you to try to make some money at it once upon a time. King encourages every writer to keep what he calls a writer’s toolbox. In that box he includes the Elements of Style by Strunk, but I think you’d be remiss not to include On Writing in that toolbox as well.